This TechTip could make a small part of your documentation easier. Take a minute to let that sink in — the technology provided to you for your job could be making that job a little easier. 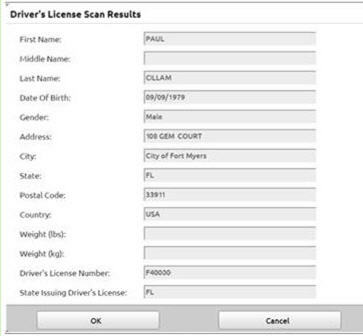 With Elite, you may scan a driver’s license for your patient report to fill in several Patient Info tab fields automatically. The fine print: This works successfully with most drivers’ licenses but not every state has been checked. Go to the Patient menu and the Patient Info tab but do not key in any information. Scroll to the bottom of the screen (well, near the bottom); find and click the Driver’s License Strip/Barcode Scanner button. Find and press the A2 button on the ePCR Toughbook, located below the gray bar below the screen. Hold the patient’s driver’s license so that the barcode (on the back of the license) makes contact with the red beam. If/when the scan is successful, you should her a zap sound and see a dialog box with a bunch of form fields filled in (complete with the patient’s information). Click the OK button and verify that the information now appears in the related Elite fields. Note: Please remember to give the driver’s license back to your patient.